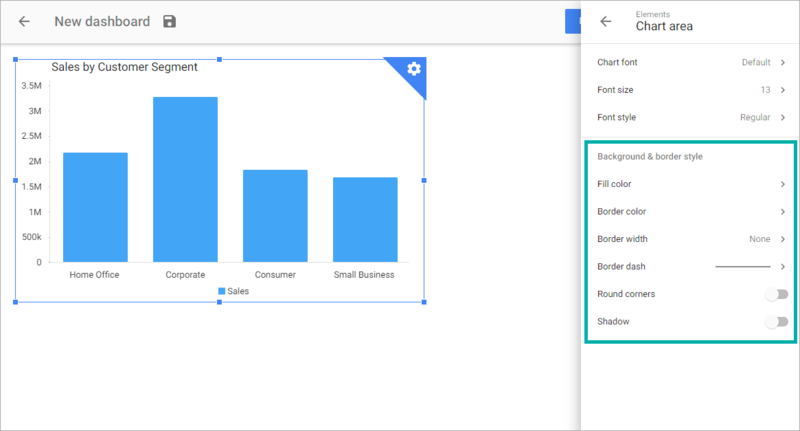 There are two ways to customize a chart: in the Chart designer or in the Dashboard editor. Chart designer. 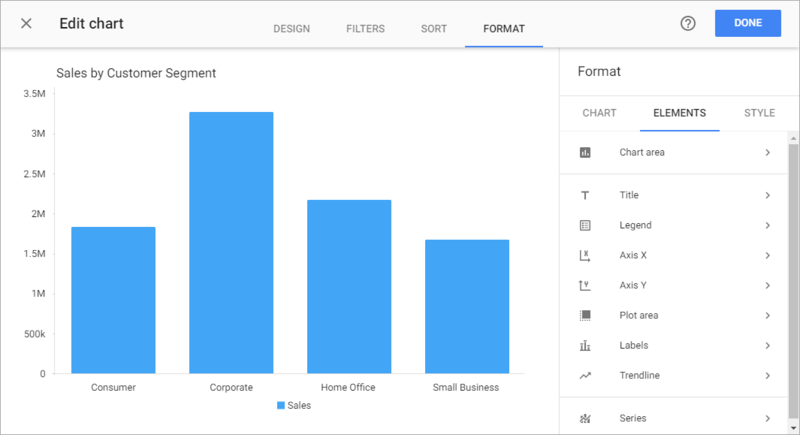 From the Format page of the Chart designer, you can customize all the chart elements – title, axis, labels, legend and so on. Select Elements tab to see the options available. Dashboard editor. Select a chart in the dashboard, click the gear wheel icon ( ) in top right corner of the chart and select Format. Swith to the Elements tab of the appeared menu and select the element of the chart you wish to customize to see its menu. If you don’t want to display a chart element, just uncheck the Visible option. Please note that some of the options for the Chart area depend on Dashboard’s Theme. 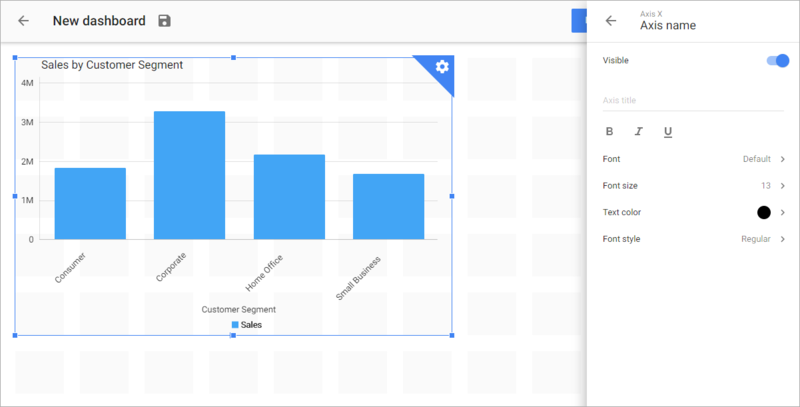 In order to add gridlines to a chart, first select the axis from which you want the lines to come out from the Format menu. If you want to display horizontal gridlines, select the vertical axis. For vertical gridlines display, select the horizontal axis. At the bottom of the appeared menu you’ll see Major gridlines and Minor gridlines options. Click the appropriate option, make gridline visible and change the line width, color and dash to desired. There are two different borders that you can add to a chart. One is the inner border and the other is the outer border. NOTE: outer border display isn’t available for the default Dashboard’s Flat Theme. To make it available, change a theme from Flat to Custom using Dashboard Settings. 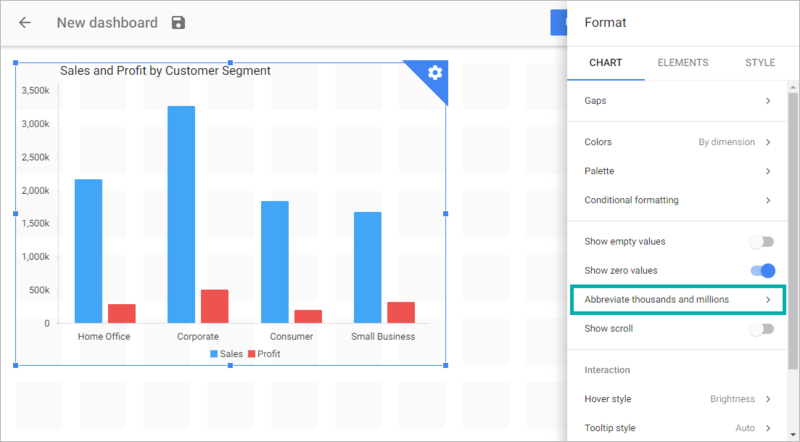 In order to put a border around the entire object (chart area), use the Format > Elements > Chart area menu. Change the Border width from None to a desired one. You can also set chart’s background and border style. To add an inner border, repeat the process with the menu for the Plot area selected. Enable Show border option. In order change the axis labels, use the Format > Chart > Axis X (or Axis Y) menu. From here, you will be able to set the frequency and angle of the labels change the font settings or add gridlines. With the horizontal axis selected for example, you can make all of the dates show and have them display at a diagonal. To add an axis name, use the Format > Elements menu. Select the axis (X or Y) and choose Axis name > Visible. Because axis names are derived from the field names in your dataset, changing axes names can take a few steps. Head over to your datasets page, click the dataset you are using and select Dataset editor. From here, select the field name you would like to change and change Field name. Please note that the charts where this measure is used, could lose the link to this measure and you’ll have to add it again. An alternative way to change an axis’ name is to use calculations. You must have at least our Small Business Plan in order to do this. 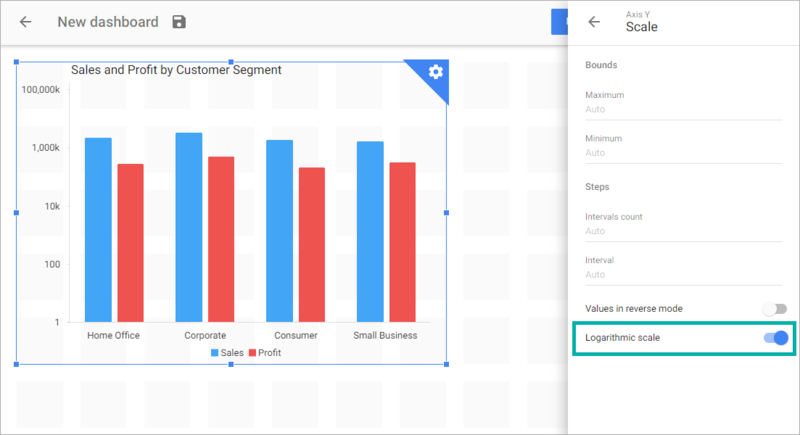 From the Chart designer, when adding a measure, choose Add calculation. From here, name the new measure the desired title and insert the old measure into the field (no equal signs necessary). This will create a new measure with a new name that is equal to the measure in your dataset. Replace the measure you are currently using in the chart with the one with the new name. In order to change the scale of your axis, first select the axis you would like to change in the Format > Elements menu. Then click the Scale option in the context menu and enable the Logarithmic scale option. By default, values like 2,000 will display as 2K. 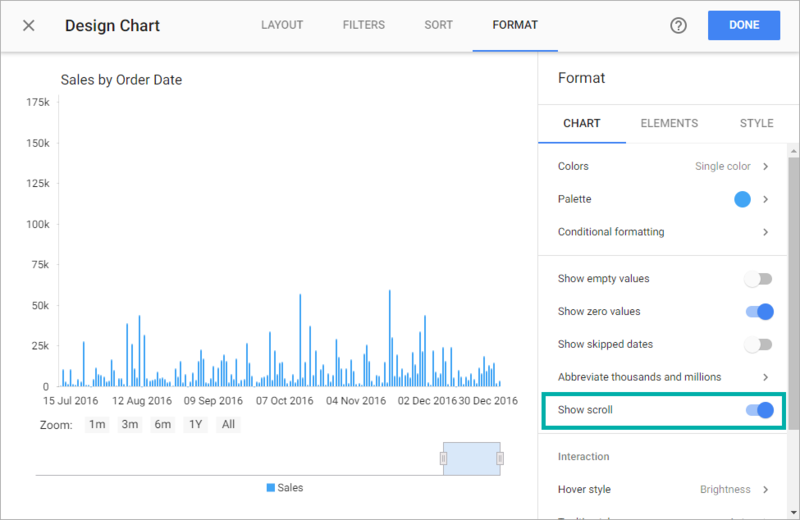 Use the Format > Chart menu to disable Abbreviate thousands and millions option. 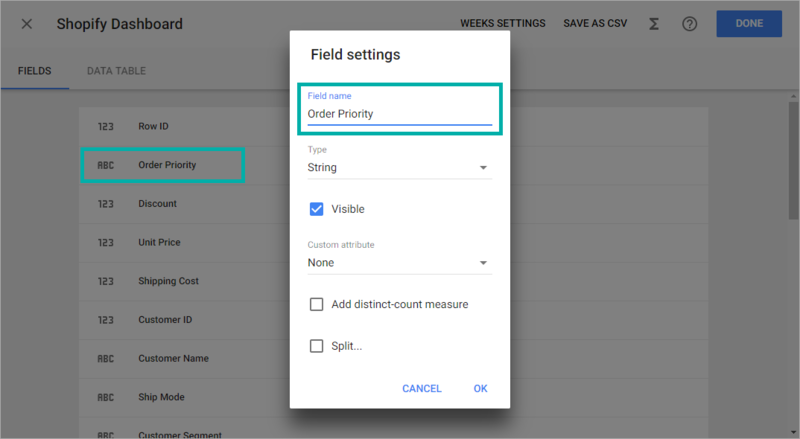 There are two ways that you can display values for the metrics you are showing. 1. From the Format menu, select Elements> Labels > Show Labels. This will add labels to every series inside your chart. 2. Alternatively, you can display values for individual series by selecting one in the Elements > Series menu. 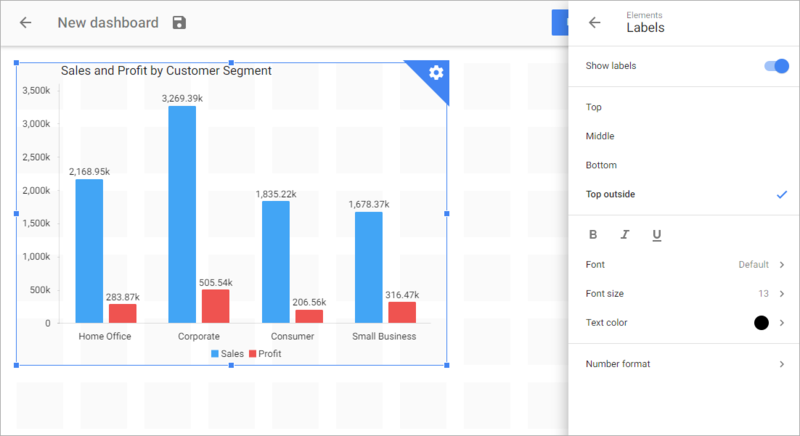 To change the color scheme of an entire chart, simply select the object and click the Palette option in the Format > Chart menu. Sometimes when displaying two different metrics on the same chart, the numbers can be so different that you can’t tell any movement in one of them. This is when you are going to want to measure the smaller value against the secondary axis. To do this, select the individual series you would like to move by clicking Format > Elements > Series. In the menu for the chosen serie, enable To secondary axis. In order to make the different series display in different ways, select one of the series in the Format > Elements > Series and use the Series type sub-menu to choose a new chart type. In order to add trendlines to a series, click Format > Elements > Series in the top menu and select Trendlines. Change the type from None to the appropriate setting. NOTE: This feature is available starting from Small Business plan. In Slemma, you can add notes to the dimension elements. Once added to an item, this note will be displayed in each chart where this element is shown. 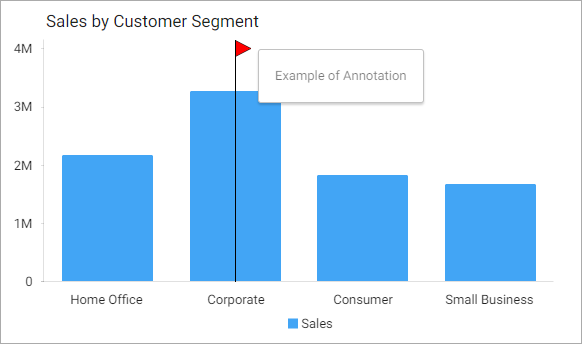 When building a chart and placing the dimension on the axis, a red flag appears for the item to which you have added an annotation (for a table, you’ll see a flag in the top right corner of the cell). When you hold your mouse over a flag, a hint with the annotation appears. From the Dashboard, right-click the selected chart and hover over Annotations. Select the level on which the annotation should be available. In the Annotations window, click ADD. NOTE: Annotations are available for cross-table and charts that have axes. After an annotation is added, the option Add annotation changes to Annotations. 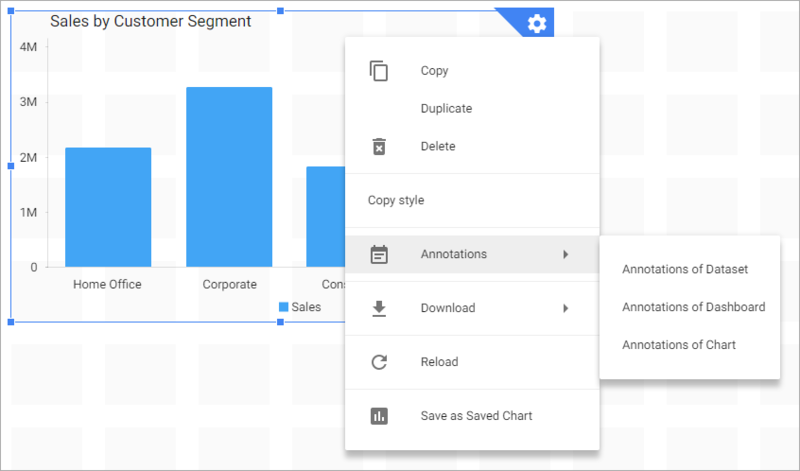 By selecting Annotations you are able to review, edit and delete existing annotations or add a new one. If you wish to comment your chart, use the Format > Chart > Description menu. Enter the description and click APPLY. To view the description, from the dashboard Reading view, right click the chart and select Description. This option could be useful when you have too much data to display and don’t want to add filters to reduce the number of elements. NOTE: This option works for Column and Bar, Timeline and Combo chart types. To enable scrolling, from the Format menu, enable Show scroll option.